Whether you’re hitting the trail or want to lose it, Southern Idaho has outstanding options for skiers and boarders who love fresh powder — and don’t want to break the bank. This beloved resort is short on frills but long on thrills. A favorite destination for families who love its affordable lift prices, Soldier Mountain is also a top pick for cat skiers thanks to its awesome snowcat (watch a flat-screen TV while you head up!) and the promise of powder at 10,095 feet. Located just 25 miles off I-84, Pomerelle has two key features: Next-to-zero lift lines and an average of 500 inches of snow. Snowboarders and skiers love Pomerelle’s long season, down-to-earth attitude, and easy-on-the-wallet rates. Magic Mountain keeps prices low because they love families — and that makes it a great place for everyone in the family. Snowboarders will appreciate Magic’s terrain park with multiple rail features and the cliff-band area with big air opportunities. 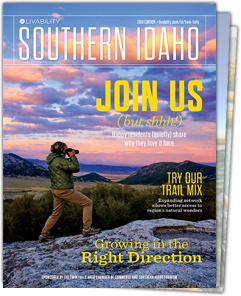 Whether you’re heading to just one of Southern Idaho’s ski resorts or want to complete the trifecta, you’ll find all the information you need to get started right here at VisitSouthIdaho.com. Check out our Adventure Map for excellent trip ideas and discover great lodging options in our Stay section. Sign up for our free newsletter or download our Travel Guide to start planning your Authentic Adventure.